This post contains spoilers for Patch 5.1. If you don’t want to know about it, then read no further! What is the Brawler’s Guild? I’m probably breaking the first rule by even telling you. 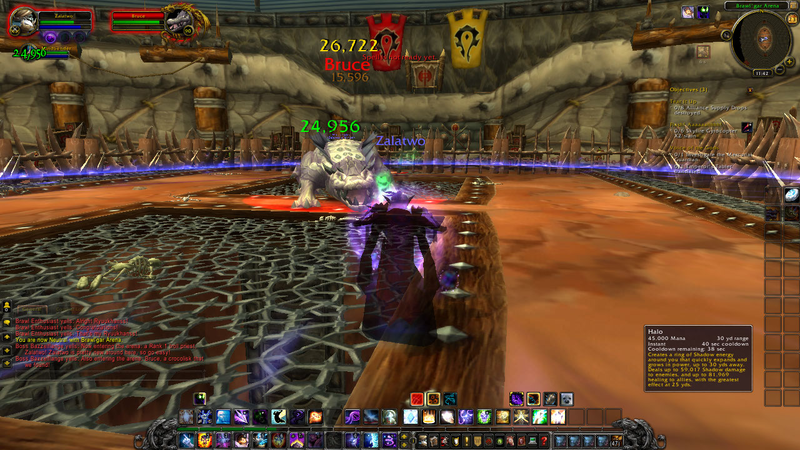 Brawler’s Guild is similar to the all of the other PvE arena events like the Circle of Blood and Crucible of Carnage, except it’s for single players. 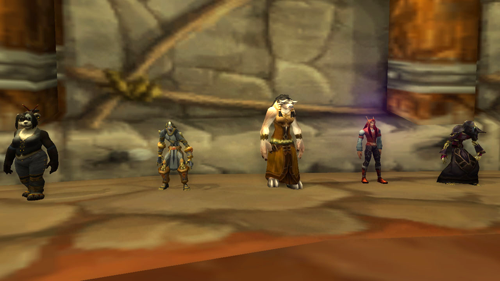 Brawl’mar Arena is located in Orgrimmar’s Valley of Honor in the same building where newly arrived Pandaren get their “gift” from the warchief. At the time that I am writing this the Brawler’s Guild is FAR from being completed. There are many bugs and features not yet implemented. But there is enough there to be able to tell you that I’m loving it! This is another of the mini-games that Blizzard is adding to the game to give us something new to do at max level. And it is very fun! A buggy but livin’ large Millhouse Manastorm! One of the bugs leaves the previous boss in the arena after a contestant loses his or her battle, forcing the next contestants to face the last boss PLUS their intended foe. Another bug sends the fight boss out into the crowd where everyone can engage it. Resurrections by running back to your corpse are not working right now. You either need a friendly player to rez you, or you have to take rez sickness from the spirit healer. When you first go into the instance all you have to do is tell one of the guards that you want to fight and you’ll be placed into the queue. You’ll wait a while until the previous contestants are finished with their fights. When it’s your turn you’ll be teleported into the arena along with an elite boss. Bruce, a crocolisk they just found. As you would expect two enter, one leaves. You wont get out of the arena until one of you dies. The initial foes are level 92 elites and fairly easy to defeat. As you progress the fights become more difficult. The crowd NPC’s can bet on players. If that player loses the fight the NPC might become irate and start brawling in the viewing area. If you’re nearby you might get sucked into the fight. This is especially fun right before you get teleported into the arena. We may be able to place bets too, but I haven’t tested that yet. These NPCs are betting on the fights. They don’t enjoy losing their bets. If you win the crowd goes wild! As you progress you’ll face different opponents ~ Oozes, Shoveltusks, Assassins, Giant Eyeballs, Leper Gnomes, Dinosaurs, Millhouse Manastorm, etc. Each one more difficult than the one before. Each with it’s own unique style of fighting. Each with it’s own strategy. 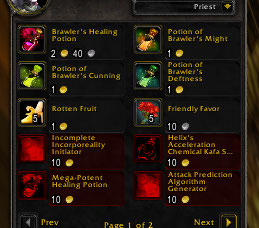 Winning fights earns you a pouch filled with gold and usually gray items with interesting flavor text. We don’t know yet if there will be anything more substantial in the reward pouches. 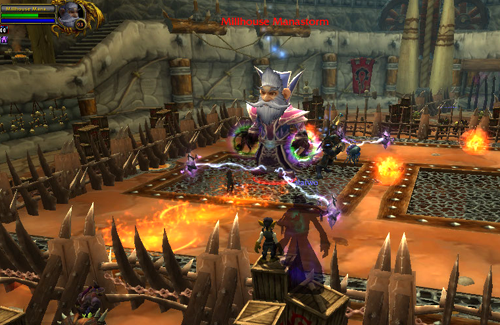 Winning also earns you better standing within the Brawler’s Guild. Right now there are 8 levels or ranks within the guild. And of course with better standing you can buy better items from their vendors, including some new heirloom fist weapons. Throw “Rotten Fruit” at players while they are fighting and it will reduce their stats slightly. Throwing “Friendly Favors” at them will buff their stats slightly. They both stack so there’s the possibility of a buff/debuff war between the friends and enemies of a contestant. It’s not even finished yet, and I’m still having a blast with this new feature and can’t wait until I see more. One final thought before I go. This is Dippy. He looks innocent. He’s not. Dippy is a penguin. He looks like he might be from Northrend. Dippy is fast. So fast that I didn’t get a good screen shot of him. Dippy is evil. Very Evil! I will get you one day Dippy!! !